Mary had a whole cabinet full of silk blouses that she'd bought at the market. She used to cut them up and use the cloth to make really beautiful things. She lived near mmmBELLYmay land, and was a friend. Blogging about nothing and dogs and stuff is easy. The hard stuff, however, is not. The end of this part of Mary's story is below. 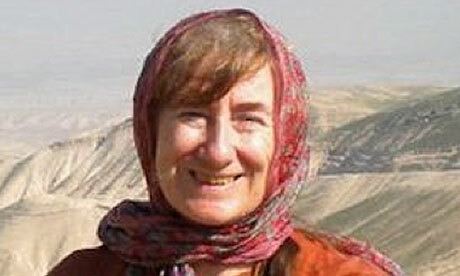 Mary Gardner, the British woman killed in the Jerusalem bus bombing, was an evangelical Christian who had been living in Togo, west Africa, translating the New Testament into the local Ifé language. She was on a six-month course in Jerusalem studying ancient and modern Hebrew at the Hebrew University prior to returning to Togo to begin work on a translation of the Old Testament. The 55-year-old had been staying in a dormitory in Yad Hasmona village, about six miles from Jerusalem, but had gone into the city on Wednesday to meet her oldest friend. She was fatally injured. Thirty others were wounded when a device weighing up to 2kg exploded near the busy central bus station. The eldest of five children, Gardner was born in Nairobi, Kenya, but moved to Aberdeenshire when she was 15. Her parents Jean, 81 and Tony, 82, who live there, said they were "devastated by the sudden loss of our daughter in this tragic and unexpected way". In a statement they said: "Mary was a very special person and we thought the world of her. She was devoted to her work and was well liked wherever she went. We are proud of her and all that she has achieved in her life and feel truly blessed to have had her in our lives." I'm so sorry! One of those random things you hope will never happen to anyone you know, but when you hear bombs going off, you know it is happening to someone's loved ones. Thank you for posting this, Nora. "...pushing to continue to the next hill even if there was no obvious path" seems a beautiful and apt description of a life well-lived. I am sorry for your loss.